Harvard students (from left) Melody Gomez, Osaremen Okolo, and Andrea Delgado in their dorm room, the same one that Facebook founder Mark Zuckerberg lived in when he attended the university. 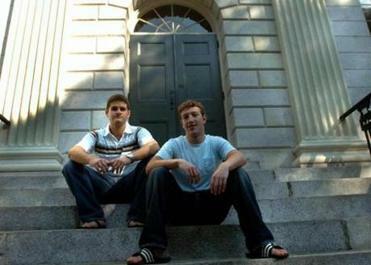 Mark Zuckerberg (at right) with Dustin Moscovitz. CAMBRIDGE — At the moment, the world’s most famous dorm room does not appear particularly conducive to greatness. A moving box sits haphazardly in the entryway, left over from the previous month’s move-in day. The hardwood floors — well-worn from years of use — could most generously be described as “rustic.” And because the suite currently houses more people (three) than it has bedrooms (two), sheets have been hung from the living room ceiling to cordon off a makeshift sleeping space. It has been called the most coveted dorm room in America. Awed strangers have been known to show up unannounced, alcohol in tow, to pay homage in a kind of curious pilgrimage. In the dozen or so years since a socially awkward undergrad named Mark Zuckerberg launched the social networking behemoth Facebook inside Room H33 of Harvard’s Kirkland House, the suite has reached an almost mythic status. But to the students who have found themselves assigned to the room in the years since Zuckerberg ditched Harvard for Silicon Valley, the reality has proven far less glamorous. “The history is exciting for a couple of minutes, or whenever you’re talking to someone new,” says 2015 Harvard grad Reid Bergsund, a San Francisco-based strategy consultant who lived in the suite two years ago. Indeed, despite its notoriety, the suite is the source of little fanfare on campus. At a school that has housed US presidents (Barack Obama, John F. Kennedy), Academy Award winners (Natalie Portman, Matt Damon) and Pulitzer-winning writers (John Updike, Norman Mailer), officials haven’t exactly gone out of their way to celebrate the room once occupied by a tech genius who dropped out. There’s no sign out front, no plaque on the door, no indication whatsoever that this is the room that birthed a cultural phenomenon. Though it is common knowledge that Zuckerberg lived in Kirkland House, the actual room number is less well-known. And even those aware of the suite’s history don’t appear to be tripping over themselves to move in. A few years back, one group of male undergrads entered the school’s annual room lottery — where numbers are drawn to determine the order in which students select their rooms — hoping for a favorable position. Instead, they finished dead last. They ended up in the Zuckerberg suite. For their part, the room’s three current occupants — Gomez, Andrea Delgado, and Osaremen Okolo — learned of the suite’s significance only after they’d begun lugging boxes up the stairs on move-in day, when a classmate stopped by to point out that they’d landed in the Facebook suite. It’s hard to blame them. Even in the context of cramped collegiate living, the Zuckerberg suite — which, it should be noted, looks nothing like the roomy residence depicted in 2010’s “The Social Network” — stands out for its lack of space and amenities. The doorway to dorm room H33 in Kirkland House, famed for housing Facebook’s Mark Zuckerberg when he went to Harvard. And this is to say nothing of the bizarre quirks that come with living in a kind of nerd-centric tourist attraction. One night a couple years back, a group of the room’s then-occupants arrived home after a night out to find a handful of strangers standing in the suite’s common area. After a couple awkward minutes, the roommates gathered that their visitors — who’d brought cake and beer for the occasion — had come to celebrate Facebook’s 10th anniversary in the place it all started. Even the room’s current occupants admit that, given the choice between their current room and a larger one, they likely would be living elsewhere this semester. This isn’t to say that living in a room once occupied by one of the country’s most prominent billionaires is completely without perks. For one thing, doing homework in a place that sparked a billion-dollar idea can be a rather motivating thing. For another, the suite affords the use of a once-in-a-lifetime pickup line: I live in Mark Zuckerberg’s old room — would you like to come see it? Bergsund actually tried it once, earning compliments for his creativity — if not a new friend. “I gave it my best shot,” he says. 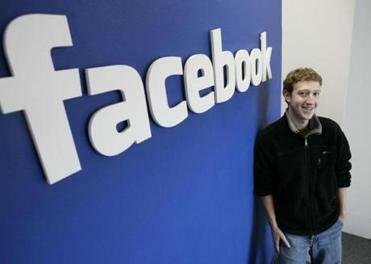 Mark Zuckerberg at his office in Palo Alto, Calif., in 2007. As for the expectations that come with occupying such a storied residence? When Okolo discovered that she’d be living in Zuckerberg’s former room — after spending her freshman year in the building once occupied by Bill Gates — her mother saw it as a sign that her daughter might be destined for a future as a tech titan. So as Zuckerberg and his roughly 11,000 employees settle into Facebook’s sprawling new Silicon Valley headquarters — which opened recently to considerable fanfare and features, among countless other amenities, a 9-acre rooftop park — the three students occupying the company’s first office are settling into a more modest existence, one that includes a non-functioning fireplace and a notable lack of electrical outlets. Crowded into Delgado’s bedroom on a recent weekday night, the roommates tried to look on the bright side. There was always the possibility, they pointed out, that Zuckerberg would knock on the door one day, hoping for a nostalgic tour of his old stamping grounds. And at the very least, they’ll have the next two semesters to tell everyone they can that they sleep where one of the world’s most recognizable businesses came to fruition. Although, as they’ve discovered, some are more impressed by this news than others. After learning the back story of her new living quarters, for instance, Gomez was talking with her mom over the phone when she mentioned that she’d be spending her junior year in the room where Facebook was invented.